The blacksmith hands-on takes place in a turn-of-the-century shop where iron is heated red hot so it can be forged into various shapes. 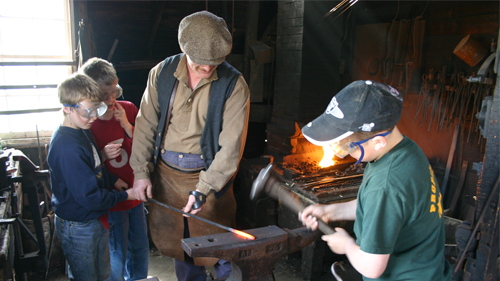 While visiting this shop, students will learn the importance of the community blacksmith and how the smithy held a vital role with the services that were provided. Students will see where oxen can be shod with the help of a somewhat primitive looking contraption called an ox frame. 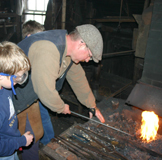 Our skilled interpreter will assist the young apprentices with making a fireplace poker or some other iron tool. Each student, taking turns, will have the opportunity to create one object within the group. The iron is heated using a coal fired forged assisted by one or more of the students turning the bellows. Whatever the object, is to be created, the group can keep it as a souvenir to display in their classroom.